Data Acquisition System and SCADA software package. GROUP Electronics has released the DAS-8000 Data Acquisition System and the PROASIS DAS-Win SCADA software package for the management of networked data. Data inputs can be configured to either remote of control room panel mounted displays using the DAS-8000. Data sequencing, supervisory information and logical action commands of industrial process controls are available visually. 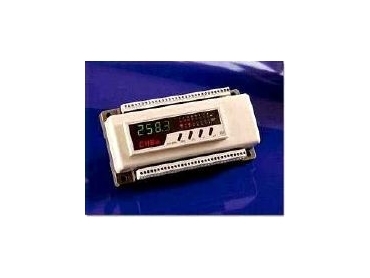 The unit is designed for stand-alone operation or bus series mode, with or without PC, utilising RS-485 Modbus. The DAS-8000 features data acquisition of analogue and logic data with eight analogue inputs, eight logic inputs and eight logic outputs. The unit offers simultaneous display of all analogue and logic values. It offers remote control of logic actuators, eight programmable alarm loops and two counters with reset, inhibition and preset functions. The controls offer a selectable range in either ºC or ºF and fully configurable inputs and ranges in Pt 100, 0-4-20mA, mV and V.
Thermocouple linearisation (T, E, J, K, N, S, R and B types) is provided for 4-20mA inputs from non linearised transmitters. A linearisable user curve is also offered. The package features on-line or locally configurable by front terminal, DIN guide on rear panel or wall mounting and a removable multifunction display. Output can be sent directly to a printer. The DAS-8000 offers RS232/RS485 selectable format. Its stand-alone or bus series network mode allows up to 255 modules (standard Modbus protocol). PROASIS DAS-Win Supervision Software is also included. The DAS-8000 is easy to use, offers configuration flexibility and adaptability, and is fully supported by software optimised for a Windows environment. The DAS-8000 is a stand-alone, intelligent processor, dedicated to the acquisition and transmission of data provided by active devices to a control location. A selection of configurable inputs, suitable for accepting variables from a variety of production and process functions, enables speedy and adaptable operation. The DAS-8000 can be remotely installed close to process sites, avoiding large distance of compensation cabling to the control room. The system is also available without integral display, which provides a cost effective remote control solution.